SPOILER ALERT for Game of Thrones fans .... don't read this is you haven't watched the latest episode of the show .... or have somehow managed to survive several days on the internet without knowing what has happened. What happens to kings who've just been murdered? Apparently they end up on the Bakerloo Line. 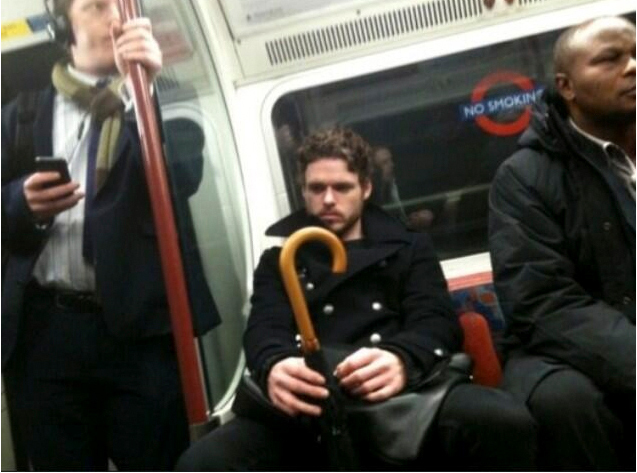 Robb Stark or rather the actor who plays him, Richard Madden was spotted on the London Underground recently, looking rather pensive. Stark very recently met a grisly end in a massacre on Game of Thrones much to the shock of many viewers. As it looks as though @DannyBlahBlah took this when the weather was a tad more inclement than it is now, one can only assume it was before his very recent demise was broadcast. All Robb aka The King of the North needed was for some Tube "joker" to say "Cheer up mate it might never happen" and then he could have turned around and said, "It already has, I've just been brutally murdered". 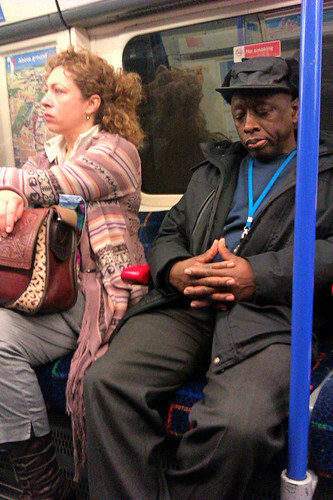 Let us know if you've spotted any other bored looking actors who play sci fi or fantasy characters on the Tube as there seems to be a growing "club" of them.